Pre-discharge MRI for the very preterm infant? For a pre-christmas present, one of the most important recent studies in neonatology. The study is related to the following question: if I wanted to know how best to counsel my very preterm baby parents about potential long-term outcomes, when they were ready to go home, how should I do this? Should I have an MRI for all of them, then talk about the results? Is a head ultrasound just as good? Perhaps imaging is not very accurate as a predictor and I should just examine the baby and summarize his clinical course? The team from “the centre for the developing brain” in London, led by David Edwards, performed this landmark randomized controlled trial. (Edwards AD, et al. Effect of MRI on preterm infants and their families: a randomised trial with nested diagnostic and economic evaluation. Archives of disease in childhood Fetal and neonatal edition. 2017). They enrolled over 500 babies who were born before 33 weeks gestation in several London hospitals. All the babies had a head MRI and an ultrasound at around term equivalent (38 to 44 weeks) at a single expert centre. They were then randomized to receive the results of either one or the other test. The results were explained to them by an experienced physician who showed them the images, gave them a copy of some pictures and discussed the developmental prognosis. For the ultrasounds they discussed the prognosis using data from their own systematic review of the prognostic accuracy of head ultrasounds for prediction of cerebral palsy, and only when there was a lesion present with a positive predictive value of more than 25%. They don’t say exactly the same thing for the MRI, giving instead the reference to Woodward’s study from the NEJM in 2006; which was a study that did not calculate the PPV of the abnormal findings. I presume they were presenting the MRI results as being adverse, and predictive of an abnormal outcome, when they showed moderate to severe white-matter abnormalities. In that study there were 35 babies (of 167 total) who had moderate (29) or severe (6) white matter abnormalities. Of whom 7 and 4 developed cerebral palsy of any degree (the GMFCS system was not used). If we use those CP numbers to calculate the Positive Predictive Value of the term-equivalent MRI it works out to 31% (11 of 35) in the cohort of Woodward et al for moderate or severe findings. In this new publication, there were 72 babies who had MRI findings considered to predict a poorer outcome, and 22 with ultrasound findings that were considered predictive. What the authors did actually do was to present the results of the un-masked test to the families. This was done as follows “An experienced physician unaware of the unallocated result discussed the allocated images and neurodevelopmental prognosis in a structured interview with parents, providing permanent examples of the images and a written summary of the prognostic information”. The “structured interview” by an experienced member of this group, among the world’s experts in evaluation and interpretation of imaging findings in such patients, would have been very interesting to see more details about. What should we say to parents when we have the results of a test with very poor positive predictive value for adverse outcomes, but relatively good negative predictive value? When the prevalence of that adverse outcome is relatively low? 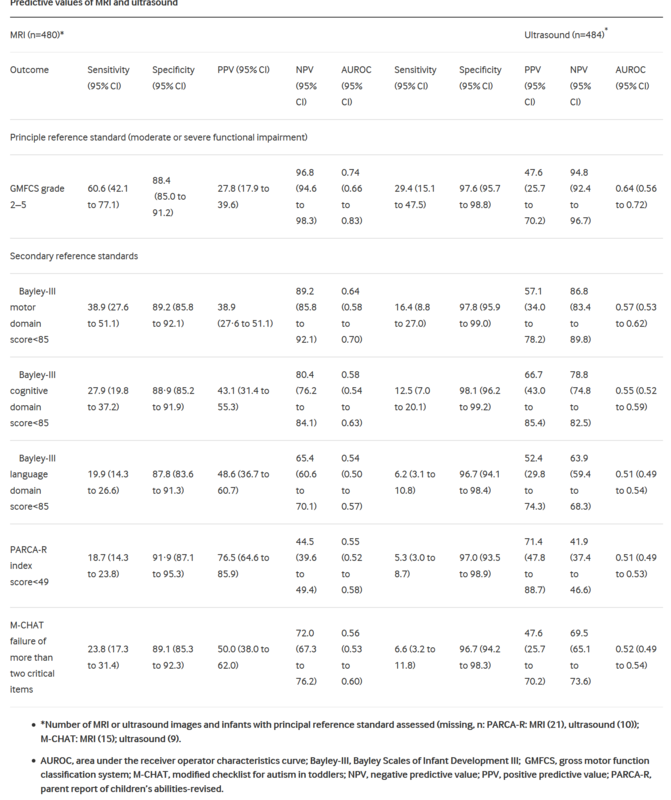 By which I mean that 92% of the infants in this study did not have CP with a GMFCS of 2 or more, similar to data in many other studies; if you have a normal pre-discharge MRI that increases to about 96%, (based on previous publications) a modest improvement in NPV over not doing an MRI, but still not to 100%. I think you could say almost exactly the same thing to parents whose baby had an “abnormal” or “predictive” result on MRI or on ultrasound as you would say when the imaging does not show such abnormalities. I don’t know what was said to the parents in this study, but they did not have an increase in their anxiety scores after the interview, indeed the scores went down a little in both groups. Anxiety scores were in fact the primary outcome variable of this study. The score used has a scale for “state”, that is how anxious you are feeling right now, and “trait”, that is how anxious you are in general over a period of time. Higher scores reveal more anxiety, and various cutoffs have been suggested as indicating clinically important anxiety, such as over 39 for young adults to over 55 for geriatric patients, the minimum score possible is 20. A previous study of parents with a baby in the NICU showed trait scores averaging in the low 50’s. In this study the mothers’ “state” anxiety scores were slightly higher in the ultrasound group before the imaging visit (by about 0.8 points), and stayed slightly higher (by about 1.5 points) throughout the follow-up to 18-24 months. A difference which was not likely due to chance (p=0.02). The “trait” anxiety scores were more similar between groups, and the fathers’ scores were not different between groups. In other words, with a structured explanation of the results from an experienced individual who understands the limitations of the imaging tests, there is no adverse impact on anxiety. Both MRI and US were followed by a small decrease in anxiety, a decrease which was slightly greater in the MRI group. But were the tests actually useful? Were they actually predictive of long-term problems, based on Bayley version3 testing and neurological examination at 18 to 24 months corrected age? Here is table 4 from the publication showing the sensitivity, specificity and predictive values of MRI and ultrasound findings. What they show basically is that the MRI finds more abnormalities, many of which are not associated with long-term problems, but some are. So the sensitivity of MRI is higher for all of the outcomes (but still relatively lousy, ranging from 18% to 60%) compared to head ultrasound (where they range from 5% to 16%), but the specificity is lower, around 90% for each outcome compared to around 97% for head ultrasound. I think for an individual family the most important metrics are the predictive values, and, because of the increased details and increased detection of white matter abnormalities, the positive predictive values of an abnormal MRI are truly pathetic: from 28% to 48% for cerebral palsy and various components of the Bayley scores. The PARCAR-R test is a parent report of children’s abilities (revised), a parental questionnaire assessment which does not have the same standardization as the Bayley scales (i.e. it doesn’t have a mean of 100 and an SD of 15 in a standardized population), but a cut-off of 49 has been associated with a reasonably good distinction between infants with and without developmental delay, MRI had a very low sensitivity for this outcome, but was fairly specific, leading to a higher PPV but a low NPV. The M-CHAT is a screening test for autism features, which is affected by language delay; the MRI and the ultrasound prediction of failure on 2 or more items of the M-CHAT were quite similar to the results for prediction of language delay. The authors of this article calculate the area under the receiver operator characteristics curves, which were modestly higher for MRI than for US for prediction of moderate or severe motor dysfunction (0.74 compared to 0.64) and for motor dysfunction, but were very similar for cognitive and language dysfunction. Finally they calculated costs, and the MRI cost about 300 pounds stirling more than the US. I think this study confirms my prior evaluation of the usefulness of brain imaging at discharge of the very preterm baby. Sensitivity is poor for any modality of imaging. Specificity is higher for ultrasound, but is problematic for MRI. Dr Edwards group and the developing human brain project (and other projects around the world) are incredibly important programs aimed at understanding how the human brain develops, and what can go wrong, so that eventually we will be able to figure out how to normalize brain development in more infants, term and preterm. These are 3-D reconstructions of the cortical surface of newborn brains, with the images showing the surface of the white matter at the top, of the grey matter next, followed by the inflated surface (whatever that means) different structures, sulcal depth maps, brain curvature, cortical thickness and T1/T2 myelin maps. You can see the progression of complexity and maturation of the brain in the last 8 weeks of pregnancy. Their detailed connectome images from developing brains are stunningly beautiful, showing the incredible profusion of connections within a developing brain. Left: Multi-shell high angular resolution diffusion data decomposed into a free water component (greyscale background image) and a directionally resolved brain tissue component shown as rendered surfaces. Middle and right: Visualisation of anatomical connections in the developing brain derived from the brain tissue component. 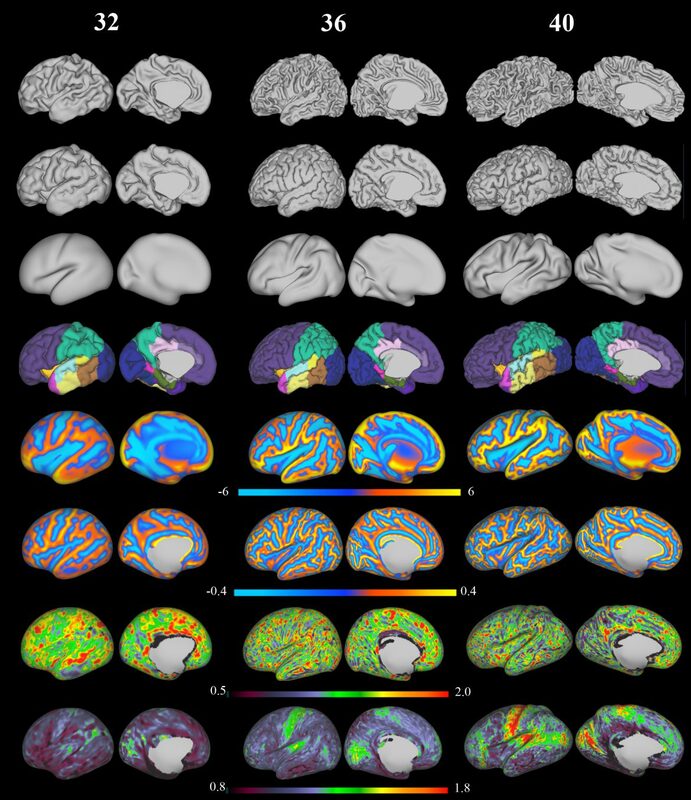 MRI (or whatever you call these kinds of data maps, MRI seems much too simple a term) is an extremely important research tool, which is not the same as saying everyone should have an MRI! Both term equivalent MRI and Ultrasound have very limited predictive ability for the former very preterm infant. This study shows, much more clearly than any before, that for an individual baby an MRI adds very little to an ultrasound, and that all former very preterm require health and developmental surveillance regardless of their imaging findings. 4 Responses to Pre-discharge MRI for the very preterm infant? Hi Keith. Thanks for the positive comments. One was that you would be interested in the information giving in the study. One of the elements of the ePrime programme was a qualitative study of that, led by Maggie Redshaw and Merryl Harvey and published in BMJ Open. 2016 Sep 26;6(9):e011472. doi: 10.1136/bmjopen-2016-011472.Qualitative study of the clinician-parent interface in discussing prognosis following MRI and US imaging of preterm infants in the UK. Harvey ME(1), Redshaw ME(2); ePrime Research Group. Keith. Your reflections are as always insightful. MRI has been shown in every study to be a stronger Neuro diagnostic tool than cranial ultrasound or neurological examination or indeed clinical factors as it defines more fully the extent of neuropathology, particularly white matter abnormalities, cerebellar hemorrhage and impaired brain growth. The relationship of these abnormalities to outcomes at all ages, particularly cognitive and socioemotional measures has been shown in elegant long term studies including that by Anderson et al in J Pediatrics 2017. Neuromaging is a diagnostic tool used to better define pathology, risk and treatment in conditions such as stroke and epilepsy. It is not asked, or indeed expected, to predict individual prognosis but rather provide insight into underlying cerebral injury and structure and assign relative risk. The modifiers of the relationship between that pathology and performance are numerous including genetics and environmental. Assigning risk groupings to preterm infants at discharge may assist parents to embrace the concept of rehabilitation rather than “early intervention”. In fact, the Edwards study may further support that information is powerful to families during an incredibly anxious time. If we as clinicians are to, as fully as possible, define the neurological impact of preterm birth and our neonatal care then we should embrace MRI at term to define this. We should then translate this imaging information into risk groupings to assist parents in understanding the importance of rehabilitation. Finally, I hope that we as a profession can move past cerebral palsy at 2 years as our primary outcome as the vast majority of challenges that our infants encompass are cognitive, emotional and on a motor domain as clumsiness at later ages. Thank you for your dedicated and thoughtful debate on this topic. It is important and I hope it continues as we hold ourselves open to view an understanding of the neurological impact of our care as central. Thanks for the comment Terrie, your contributions to this field have been exceptional. You have clearly shown that adding high-quality brain imaging to a description of the social circumstances and clinical history helps somewhat to discriminate between infants who will have long term problems and those without. I would suggest that the improvement in prediction is actually quite small. One way to quantify the improvement in prediction is with the likelihood ratio. Using the data from Edward’s study (that is, without adjustment for other risks mentioned above) the positive LR for cerebral palsy is 5 (that is the change in the Odds of that diagnosis when the test is abnormal), the negative LR is 0.45. Neither of which figures give sufficient confidence as far as I can see to change the approach to an individual baby, and of course we all deal with individuals. From their data again, the pre-test odds of CP is 34/446 or 0.08. If the MRI is moderately or severely abnormal the post-test odds is (0.08 * LR) 0.4, which gives you the post-test probability of 0.28 (Odds/(Odds+1)). An improvement in prediction from 0.08 to 0.28 is not nothing, but is it good enough to recommend that every very preterm baby has this imaging? I agree totally that a diagnosis of cerebral palsy at 2 years of age is a very limited outcome variable, that must be supplemented by other indicators of motor function, which are more frequent and may become evident in later life. The excellent study that you published with Peter Anderson does show a statistically significant worsening of motor scores with increasing white matter abnormalities on MRI, and a statistically significant worsening of IQ scores with deep grey matter and cerebellar abnormalities; but there is a huge overlap of scores, with less than a 1SD difference between the group with a normal MRI and those with the moderate or severely abnormal images. I can’t do the calculations from Anderson et al, but, for example, from Edwards et al, the positive LR for a Bayley version 3 cognitive score when the MRI was abnormal was 2.7, and the negative LR was 0.8. I submit that LRs which are so close to 1 don’t (and shouldn’t) give us enough confidence to change the approach to surveillance and evaluation of very preterm babies. Bayley scores are clearly an inadequate method for evaluating cognitive skills, and cognitive potential. Most children with low Bayley scores will not turn out to have cognitive impairment, but many other important problems will become evident during prolonged surveillance of these babies. We all want to do what is best for the babies under our care, and to ensure the best possible outcomes; if assigning risk groupings, as you put it, at discharge does help the babies or their families then I will be all for it. I think we can already say that any baby born at less than X weeks of gestation (pick a number) is at increased risk compared to babies who are more mature, and babies born at less than X weeks of gestation with complicated courses, and with socio-economic hardship, are at higher risk. Infants with those risk factors who have MRI abnormalities seem to be at somewhat higher risk than those without MRI abnormalities, but, to my mind, that final step of differentiating into risk categories according to MRI findings is relatively lacking in power. Brain injury and lung injury are the 2 most important long term consequences of very preterm birth (and they are of course linked) finding ways to reduce both, and reduce their adverse impacts does need to be the focus of our efforts. Anderson PJ, et al. Associations of Newborn Brain Magnetic Resonance Imaging with Long-Term Neurodevelopmental Impairments in Very Preterm Children. The Journal of pediatrics. 2017. Nice to be debating his issue. A couple of thoughts. 1. I agree Cerebral Palsy is not the only or even probably the most important outcome. But routine T1 and T2 weighted MR is even worse at predicting cognitive outcomes for individuals, both in the EPrime paper and in the unpublished 4 year follow up of the cohort. The additional reduction in maternal (not paternal) anxiety with MR is statistically but not clinically significant. 2. My own view is that the conventional descriptions of preterm pathology need reviewing. Data driven, unbiased machine learning analysis of the same EPrime images produces a very different set of features linked to adverse events and outcome (anyone interested can look at the data in an interactive viewer on Neurovault, I’d be happy to sent the link, or it’s in a paper by Ball et al, Annals of Neurology, 2017). 3. In reality, much of the prognostic information captured by imaging is already held by the gestational age (this is intuitive but can also be shown formally). 4. MR is a fantastic research tool, the images are very rich in data and are our best chance at understanding what is actually happening to our little patients, especially if linked to other data. The EPrime study may have cast doubt in the value of routine conventional MR for prognostic purposes at the level of the individual, but at the group level the same images are eloquent and have so far uncovered 2 completely unpredicted genes linked to adverse outcome, one of which has an available and safe modifying drug. Again happy to expand if anyone is interested. So I agree that MR is a wonderfully useful technology.